This is a new Ben 10 game.Ben 10 must complete levels full of exotic obstacles and monsters. 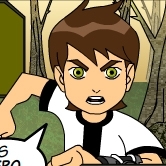 Ben 10 can transform into 4 different creatures and takes advantage of their special powers. Many obstacles cannot be passed otherwise.